OMEGA Short Double-Ended Hi-Lok® Roller Ratchet® with thru-hole for hex keys feature one end for clockwise rotation, the other for counter-clockwise rotation. OMEGA Double-Ended Hi-Lok® Roller Ratchet® eliminates the need for a reversible spindle which reduces the occurrence of foreign object debris (FOD) and increases efficiency. OMEGA Roller Ratchets® were designed as a response for the need of small ratchet wrenches that could be used in tight areas where the swing of the handle was limited by obstructions, and to have a ratchet or tool that would work with very little handle movement. Roller Ratchets® satisfies both of those requirements. OMEGA Double-ended zero backlash Hi-Lok® Roller Ratchet®, 1/4'' square drive, with thru-hole for hex keys, 6.7'' OAL, 200 lb./in. max torque. Features one end for clockwise rotation, the other for counterclockwise rotation. 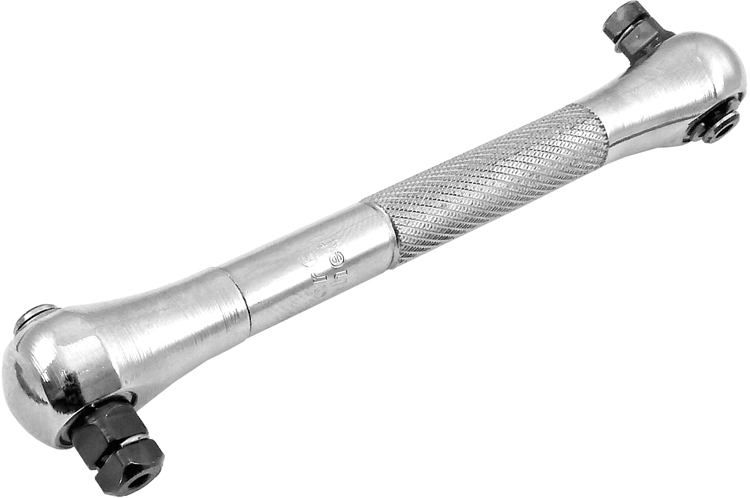 The OMEGA RR2E40S-SP Double-Ended Short-Handle Roller Ratchet, 1/4'' Square Drive is one of thousands of quality tooling products available from MRO Tools. Please browse Double-Ended Roller Ratchets for tools similar to the OMEGA RR2E40S-SP Double-Ended Short-Handle Roller Ratchet, 1/4'' Square Drive. OMEGA RR2E40S-SP Double-Ended Short-Handle Roller Ratchet, 1/4'' Square Drive description summary: OMEGA Short double-ended zero backlash Hi-Lok® Roller Ratchet®, 1/4'' square drive with thru-hole for hex keys, 4.5'' OAL, 150 lb./in. max torque. Features one end for clockwise rotation, the other for counterclockwise rotation. Quantity discounts may be available for the OMEGA RR2E40S-SP Double-Ended Short-Handle Roller Ratchet, 1/4'' Square Drive. Please contact MRO Tools for details.